I was craving pesto the other day, as I often do during the warm summer months, but I didn’t have any fresh basil on hand. This is often a problem when basil is the primary ingredient… While normally I would turn to something else for dinner, I couldn’t get the craving out of my head, so I started searching through my refrigerator for what I had on hand. Admittedly, it was pretty slim pickings. I did, however, have a bag of spinach; it’s leafy, it’s green…this could work! Using my favorite pesto recipe from Giada’s Everyday Pasta as inspiration, I started swapping and mixing ingredients and working with what I had. The result was a combination of baby spinach, toasted walnuts, lemon juice and fresh parmesan, and it was wonderful! A new twist on your traditional pesto, this spinach version not only offers incredible flavor, but it is also very affordable. Bonus! In fact, I feel that unless you grow the basil yourself, preparing your own pesto can get rather expensive, especially with those pricey pine nuts. When you use spinach and walnuts, however, the price drops significantly while the flavor remains deliciously fresh. 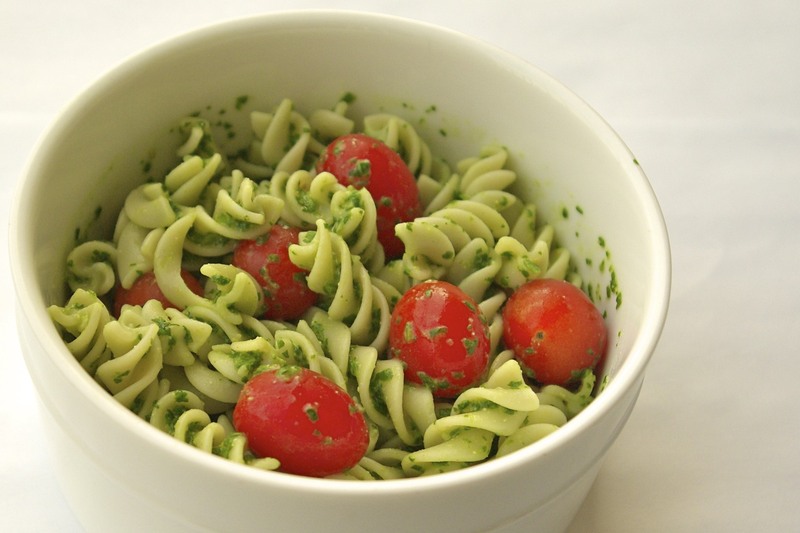 Mix it in with pasta, pour it over grilled meat, schmear it on a sandwich or dab it on your pizza; whatever way you eat this pesto, I know you will enjoy it! 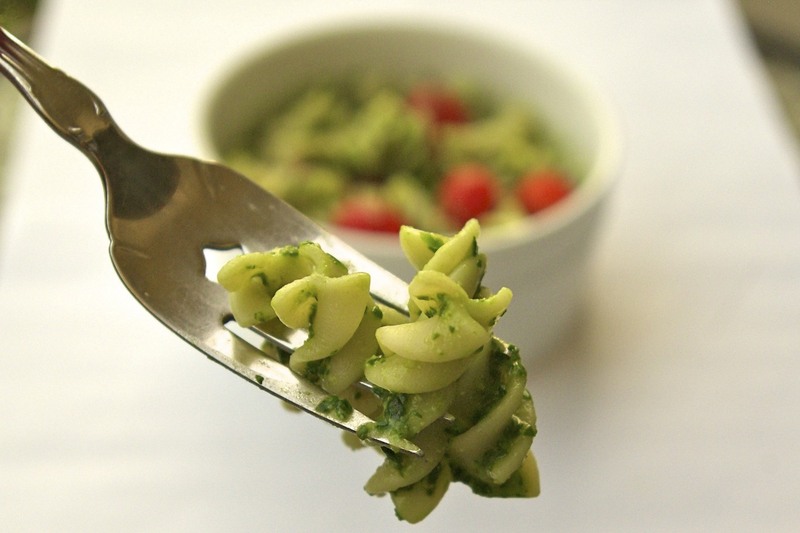 What is your favorite way to eat pesto? Let me know below! Paula’s Notes: *I use about 1/3 cup of extra virgin olive oil in this recipe. 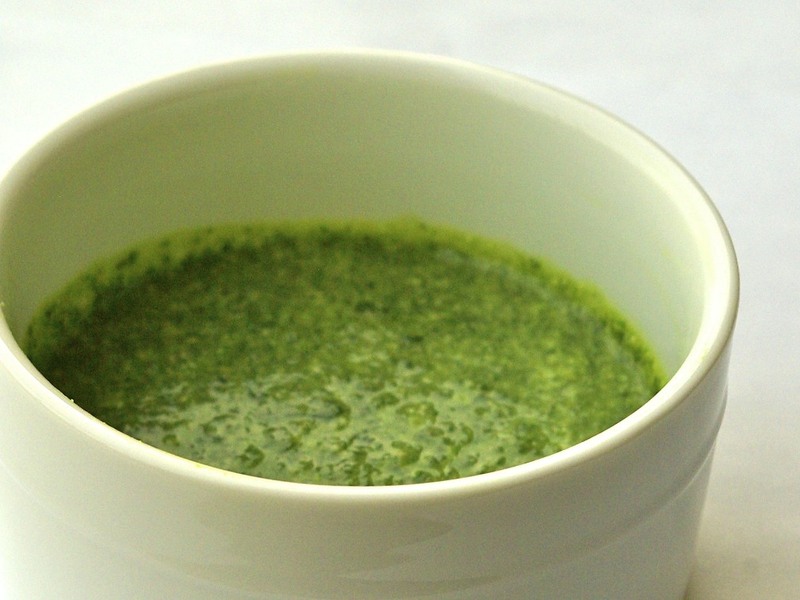 If you prefer a thinner or thicker pesto sauce, simply adjust the oil accordingly. *Also, I like to freeze my leftover pesto in ice cube trays, and then transfer them to a freezer bag. This way when you have a pesto craving, simply take out a few cubes and you’re all set! In a food processor, combine spinach, toasted walnuts, minced garlic, parmesan, lemon juice and broth. Pulse several times. With processor running, stream in olive oil until desired consistency is reached, about 1/3-1/2 cup. Basil when it's in season is super cheap here, but once it's gone you can't find it anywhere, which always makes me sad. I agree – pine nuts are too expensive and I always use walnuts too.